Pollo in potacchio is braised chicken dish that hails from Le Marche, a region that sadly I never got to visit during my years in Italy. And truth be told, I know little of its cookery, other than olive ascolane from Ascoli, which we featured on the blog some time ago, along with the region’s incredibly rich version of lasagna, vincisgrassi, which I hope to blog about one of these days. Both dishes, especially the vincisgrassi, are elaborate, time-consuming dishes, but pollo in potacchio is an everyday affair, using a simple two step sauté-then-simmer cooking method much like coniglio alla cacciatora or pollo alla ischitana. But one may be the simplest of them all, reducing the method to its essential barebones. You cut up a chicken and brown it in garlic-scented olive oil, then simmer it with a splash of white wine, rosemary leaves and a bit (or a lot) of tomato until tender and cooked through. You’ll have your pollo in potacchio on the table in less than an hour. If you ask me, it’s one of those culinary standbys we should all have in our repertoires. Cut up the chicken into serving pieces of roughly equal size. (See Notes for details). Dry all the pieces thoroughly with paper towels and set aside. In a braiser or sauté pan large enough to hold all the chicken pieces in one layer, sauté the garlic cloves in abundant olive oil over moderate heat for just a minute or two, until you can smell the aroma and the garlic is starting to brown lightly. Remove the garlic and add the chicken pieces. Brown them lightly but thoroughly on all sides, seasoning with salt and pepper as you go. Pour on a splash of white wine and tomato purée, then cover the pan, leaving the lid slightly ajar. Simmer gently about 30-45 minutes, or until the chicken is tender and cooked through, turning the chicken pieces at least once. Add water if needed to keep things moist and, about halfway through, the rosemary leaves. By the time the chicken is cooked, the pan juices should be well reduced; if not, continue simmering uncovered for a few minutes. Serve the chicken hot, napped with the pan juices. Simple as it is, there is one tricky part of making pollo in potacchio. Chicken tends to be a bit “sticky”. If you’re not careful, the chicken skin will stick to the pan and tear as you try to turn it. You can avoid this by using a nonstick pan, of course. But then you lose all that delicious fond that makes the pan juices so tasty. The better way is to heat the pan well (you should be able to feel the heat radiating when you place your hand about 6 inches above the surface) before you add oil or anything else to it. Something to do with opening (or is it closing?) the pores in the metal. I can’t remember the science, but it does prevent sticking. You will also need to be careful about adjusting the amount of liquid in the pan, making sure there’s neither too much or too little. Some chickens, especially the ‘factory farmed’ variety, can give off an awful lot of liquid. On the other hand, sometimes you need to add liquid to make sure things stay moist. You want a nice amount of pan juices to use as a sauce, but the chicken should not be swimming in liquid. Cooking times can also vary depending on the age and quality of the chicken. Old-time recipes specify an hour or more, but young chickens these days are likely to need only half that much time. 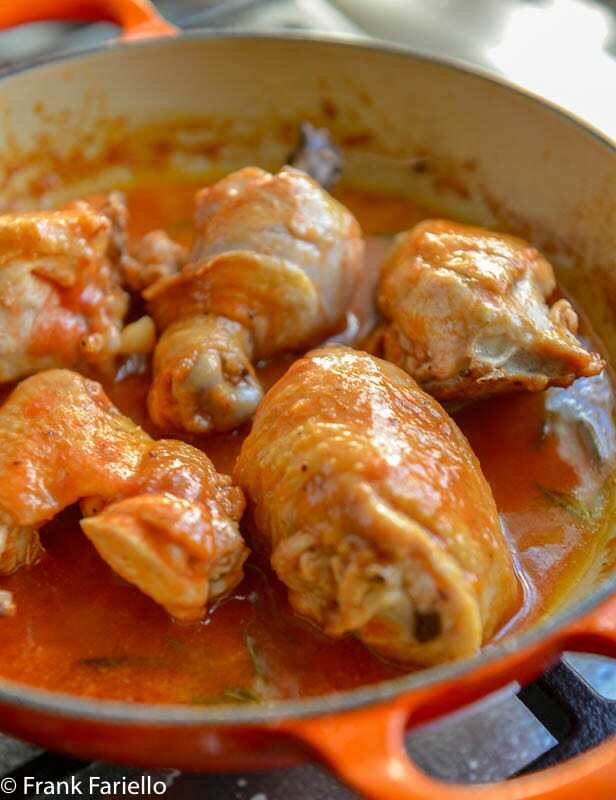 In a recipe for pollo in potacchio in her iconic Talismano della felicità, Ada Boni calls for browning the chicken pieces in a soffritto of minced garlic and rosemary. It seems all too easy to burn the garlic that way and, in any event, I generally prefer the subtler taste of garlic that’s browned whole and removed. Recipes are all over the map about amount of tomato. Some (like this one) call for just enough to tinge the sauce, others veritably smother the chicken in tomato, almost an in umido style. And everything in between. I rather like Silvia Colloca’s version using little cherry tomatoes, added towards the end of cooking. And if you don’t care for rosemary leaves in the sauce, you can add the whole sprig to the pan, then remove it. Pollo in potacchio is often accompanied by potatoes, which are sometimes added to cook along with the chicken, sometimes served separately. Besides chicken, you can use the same potacchio method to cook rabbit and lamb, or even a firm-fleshed fish like monkfish. You can, of course, buy pre-cut chicken pieces to make your pollo in potacchio. It’s a great convenience. But it’s much more economical to buy a whole chicken and cut it up yourself. Not only is it cheaper by weight, you get the carcass to use for making homemade broth. You want to pull the leg and thigh away from the breast, and cut into the crease between the thigh and the breast. Separate the leg and thigh along the joint. Separate the wings from the breast, and then trim the tips off the wings. Personally, I’m not partial to chicken breasts in a braised dish like pollo in potacchio. The breast meat tends to dry out. I prefer to set the breast aside for cutlets or other such quick cooking methods. But if you really like “white meat”—as many people do—and want to include it, cut the breasts from the carcass, leaving the ribs attached underneath, and cut along the breast bone to separate the two breasts. Then cut each breast crosswise into pieces about as large as the thighs. Traditionally, this meant cutting each breast in half, leaving you with four pieces. A lot of chickens these days, however, are bred to have absolutely enormous breasts that might need to be cut into thirds or even quarters. In any case, you may want to take the breast pieces out early to avoid overcooking. Cut the chicken up into serving pieces of roughly equal size. Dry all the pieces thoroughly with paper towels and set aside. Pour on a splash of white wine and tomatoes purée and cover the pan, leaving the lid slightly ajar. Simmer gently about 30-45 minutes, or until the chicken is tender and cooked through, turning the chicken pieces at least once. Add water if needed to keep things moist and, about halfway through, the rosemary leaves. By the time the chicken is cooked, the pan juices should be well reduced; if not, continue simmering uncovered for a few minutes. This sounds like wonderful comfort food for this cold weather. I can easily imagine a little pasta on the side. Thanks for stopping by, Stefano! Interesting! I wasn’t familiar with the term ‘potacchio’ until now. My guess is those origins of the world are all connected in some way. That tends to be how things work with the Romance languages. (I credit my ability to fumble through foreign countries to my years of Latin.) Whatever name is used, this recipe sounds delicious! I agree that a flavorful recipe like this just belongs in everyone’s repertoire. Saving this to try sometime soon! Hope you like it, David! A relatively simple recipe but I can only imagine how wonderfully flavourful it is. Anything with such few ingredients, cooked well, is such a comfort to enjoy. I can’t believe it can be ready in so little time, which is perfect for a weeknight. Indeed it is, Eva. Thanks so much for stopping by! Fantastic recipe Frank! This reminded Panos the way his mom and grandma used to cook chicken, only they both added rice at the final step, to make the dish more hearty and filling perhaps. I’ve already made it! We had this for dinner tonight, along with sautéed potatoes and salad. It was a huge it with my husband and teenage boys. The only thing I did differently was to leave the garlic in the pan, and I may have used an extra clove or two. (I love garlic!) It was so easy to put together and the few ingredients created so much delicious flavor. Thank you. Cheers! I just met a woman who raises chickens and sells them to a few lucky ones that know about her. I can’t wait to have a real chicken in my pot using your recipe. That would be awesome, Gerlinde. Do let us know how it turns out if you try this out. Very simple indeed but there are differences to note. I normally do not remove the garlic nor have I used rosemary which I love. The amount of liquid methinks depends not only on the chicken used but the size of the pan: a case of keeping one eye on the pot . . . must admit to using thigh pieces from a good supplier: money versus time I’m afraid 🙂 ! Well, those chicken part are very practical if you’re pressed for time. I’ve made this dish and it is very good! Agree with Paola! How can you go wrong with tomatoes, white wine and rosemary! When I braise a whole chicken I brown everything…remove the wings and the breast…continue on cooking the rest of the chicken for about 15 minutes then add the wings and breast and cook until they are done…seems to work well for me. Indeed. Thanks for stopping by, Paola! Such a nice, simple dish — definitely one we all need in our repertoires. I’ve done similar dishes, bur without the tomato and didn’t use rosemary. But I’ll definitely make this version — thanks. Le Marche , bellissima regione ! L’ho visitata poco ma spero di poter ritornare, lì il turismo di massa non è ancora arrivato e in tanti borghi il tempo sembra essersi fermato ! Ottima ricetta se si trova un pollo allevato a terra in modo naturale, il sapore sarebbe divino ! Buona domenica Frank ! That just looks so delicious! I like your subtle use of the tomato paste and the “abundant” olive oil. I’m planning on trying this sometime soon. Thanks, Frank! Hope you like it, Kath! It really looks good good. Does remind of cacciatore style dish. I had to chuckle when I saw the ingredient passata. This reweek I reshot some photos of my chicken cacciatore. My recipe calls for sauce, I thought I had some and didn’t. What we did have was passata — I used it and I thought it turned out just as good if not better. My mamma always used to make the wild birds alla cacciatore. I love your explanations and David’s clucketarians –🤣Buona Dominica! Yes, I’ll take passata over tomato sauce any day. Thanks for the kind words, Marisa! This is actually our favorite type of dish – comforting, falvoreful, and easy to prepare. We have had a lot of guests lately who only eat chicken – clucketarians? – and I am running out of repertoire! I needed this dish for a dinner this week… thanks, Frank! Looks delicious! The whole factory farmed thing is horrible. The worst thing recently is that even our good local farmers are raising the Frankenstein chickens because the abattoirs won’t process anything else. One step forward, one back. Oh dear… the food production scene can be so discouraging sometimes! I couldn’t agree more, Ron! This dish was one of the evergreens while I was growing up and it is still present in our family; the only thing that changed is store bought chicken instead of those from my grandmother’s farm. Since the beauty lies in simple things and it’s varieties suiting the chicken parts and side dishes, I hope your beautiful and detailed post will serve the purpose : to spread the idea and be remembered ! Thank you Frank ! I hope so, too! Dishes like these are so easy but yet so delicious. No reason not to cook at home! And you were lucky to grow up on farm chickens—must have been wonderful.